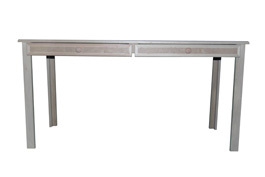 Order your euro desk table in any width, height, and depth. You can also add drawers, shelves, and/or pull out trays to your table. The one pictured is 60″ wide with two paper drawers.